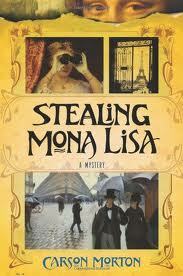 The novel, Stealing Mona Lisa, by Carson Morton is based on the actual theft of the Mona Lisa from the Louvre in 1911. The story begins as a reporter goes to a rooming house to speak with the dying Marquis Eduardo de Valfierno. The Marquis begins his story of the theft of the world’s most famous painting in Argentina, where he and a small, close-knit group of cons fleece the nouveau rich with copies of famous paintings they pass off as the stolen masterpieces. Valfierno meets his match in one of his clients, the wealthy industrialist Joshua Hart who plays a crucial role in the story and plays a role throughout. More surprising though is Mr. Hart’s wife and the role she comes to play in Valfierno’s schemes. The novel was published on the 100th anniversary of the crime and although slow in a few spots, the book is worth the read to get to the surprising end. Carson Morton does a terrific job of tying the story together at the end and leaves me wanting to learn much more about the real theft of the Mona Lisa. Book Details: Published byMinotaur Books; First Edition edition (August 2, 2011), 352 pages, ISBN: 031262171X. Check back often for reviews and don’t forget to leave a comment and let me know what is on your summer reading list! Author thebookloverPosted on June 21, 2011 Categories Book NewsTags Anatomy of a Disappearance, Ann Patchett, books, Carson Morton, Felix J. Palma, Hisham Matar, reading, Samuel Park, State of Wonder, Stealing Mona Lisa, summer, summer reading list, the booklover, The Devil All the Time, The Language of Flowers, The Map of Time, The Secret History of Costaguana, This Burns My Heart, Vanessa Diffenbaugh1 Comment on What’s On Your Summer Reading List?